It was a tale of two hugs. 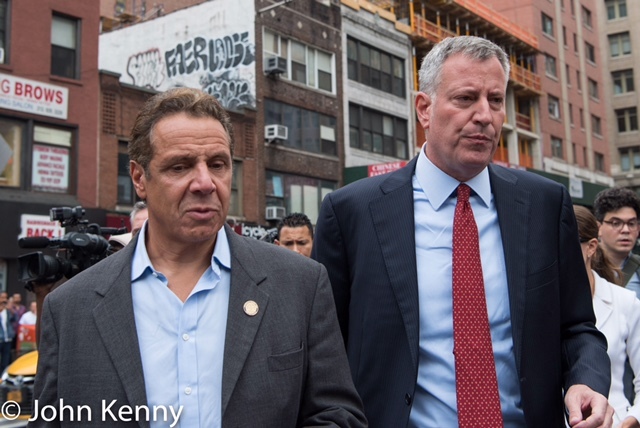 Governor Andrew Cuomo and Mayor Bill de Blasio briefly put aside their differences this morning to jointly visit the site of Saturday night’s explosion in Chelsea. They did not make any public comments or answer press questions during their walk, however, instead holding separate press conferences. 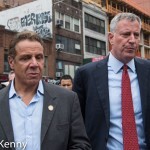 Cuomo spoke with the press at the site shortly before their walk, following an initial unannounced site visit by Cuomo, while de Blasio spoke with the press shortly afterwards at NYPD headquarters. de Blasio had also held a press conference Saturday night at the site. The governor and mayor met just outside the security perimeter at 23rd Street and Seventh Avenue, hugging hello and then moving inside the security perimeter accompanied by aides, their own respective photographers and videographers and a small press pool. They spoke with a few small groups of residents and business owners/employees inside the perimeter as they made their way to and from the blast site. Most of the large press presence observed from outside the perimeter, about 100 yards from the blast site. Cuomo and de Blasio wrapped up their walk with a visit to a Starbucks just outside the security zone, press excluded. Emerging from Starbucks the pair again hugged, amid a press crush, then parted. Our photo gallery is here.